APRIL 5, 2019: Welcome back Jill and John who both went to ACS Orlando! John presented several musical works while Jill gave a talk on inorganic spectroscopy and HEMACs! JANUARY 8, 2019: Goodbye to Dr. Partha Halder as he heads back to India. Great work and safe travels! JULY 19, 2018 Congrats to Jill Chipman on her second paper highlighting her work on facile axial ligand substitutions on MoMoNi chains! JULY 3, 2018 Congrats Dr. Pakula on a well deserved Inorganic Chemistry Communication on some unusual properties of palladium acetate. A well earned great job! 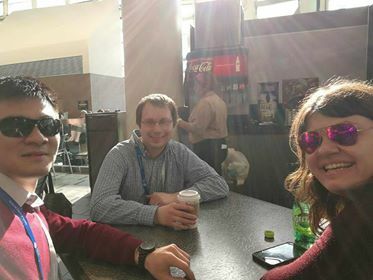 JUNE 22, 2018 John, Caleb, and Jill return from the Inorganic Gordon Conference in Biddeford, Maine! All areas of our work were well represented. Great job! JUNE 1, 2018 Welcome David Beshensky to the Berry Lab! He will be doing undergraduate research with Jill! JUNE 1, 2018: Welcome 0th year graduate students Amelia Wharton and Cesar Saucedo who are working with us for the summer! MAY 23, 2018 Congrats Dr. Ryan Pakula (#13) on a great thesis defense ! MAY 11,2018 Congrats Dr. Nick Yang (#12) on an outstanding thesis defense!! Off to bigger and better things at his post-doc at MIT! APRIL 30, 2018 Congrats Michael Roy and Dan SantaLucia for Passing Their Second Year Thesis Background Oral Exams! APRIL 20, 2018 Sungho Presents his Work to the Department at Supergroup, Nice Work! APRIL 4, 2018 Welcome Back Alum Michael Nippe for an Inorganic Seminar! MARCH 29, 2018 Nice work Nick and Jill presenting their work at the ACS National Conference in New Orleans! March 29, 2018 Congrats Nick for winning the Chemical Computing Group Award at the most recent ACS National Conference in New Orleans! Copyright © 2019, Berry Group. Theme by Devsaran.